Now God worked unusual miracles by the hands of Paul, so that even handkerchiefs or aprons were brought from his body to the sick, and the diseases left them and the evil spirits went out of them. Then some of the itinerant Jewish exorcists took it upon themselves to call the name of the Lord Jesus over those who had evil spirits, saying, “We exorcise you by the Jesus whom Paul preaches.” Also there were seven sons of Sceva, a Jewish chief priest, who did so. Many other magicians converted during the early centuries of Christianity, when paganism prevailed and Christians were persecuted by the pagans. Among them were St. Gargalos (Sept. 29) who was a pagan priest under King Sapor of Persia and was martyred with Sts. Dada and Gobdelaas in the fourth century, St. Athanasius (Apr. 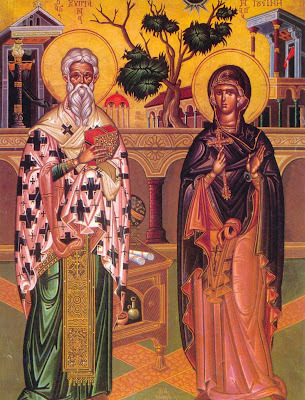 23) who was a magician under Emperor Diocletian and was martyred in 303 A.D. after witnessing the sufferings of St. George, and St. Marus (May 31) who was a magician and martyr under the Procunsel of Comana Sebastian in the second century and converted after failing to be able to poison St. Hermias the Great Martyr. The most famous magician of the early Church to have converted to Christianity is the Holy Hieromartyr Cyprian (Oct. 2). Cyprian was a pagan magician of Antioch who was dealing with demons. By their aid he sought to bring St. Justina, a Christian virgin, to ruin; but she foiled the threefold attacks of the devils by the sign of the Cross. Brought to despair, Cyprian made the sign of the Cross and in this way was freed from the grip of Satan. The story of St. Cyprian became especially popular among Christians during the reign of Julian the Apostate, who in the middle of the fourth century tried to revive paganism in the Roman Empire, and his tale strengthened Christians to not sacrifice to the pagan gods, whose power was nothing before the Cross of Christ. Sts. Cyprian and Justina are even today invoked as patrons of those who have become influenced by demons and magic. 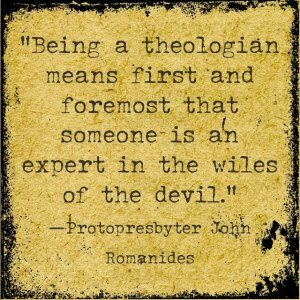 Even in our modern times there are examples of those who practiced the dark arts and converted to Christianity. Vladimir Bykov was a well-known Spiritualist in Russia who abandoned his craft after meeting with the holy spiritual fathers of Optina Monastery. He wrote a book titled Calm Havens for the Respite of a Suffering Soul. He would come to say: "Spiritism is demonic! Orthodox Christianity is your answer." Vladimir eventually became an Orthodox Christian priest and in 1924 or 1925 was martyred for his Orthodox faith by the atheist communists. More recently in Greece a former magician, Evangelos Koutroubelis, became an Orthodox Christian, and wrote a book against magic and the dark arts, titled The Deceiver of People (published by "Astir" in 1994).